Atlantic Views from this 6 Bedroom, 4.5 Bath Family Vacation Oasis! 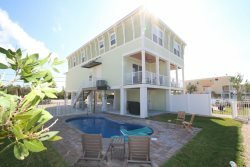 This Canal Front Family Oasis Vacation Rental Home located in Marathon, Florida has 6 bedrooms, 2 sleeper sofas, 4 full bathrooms and one half bathroom throughout the home. SeaBreeze greets you with Plenty of Parking and a Luxurious Coastal feel. Lounge in the Living Room with ample seating while watching a movie on the Smart TV or gather around the coffee table and enjoy some fresh seafood with your guests while seated on the Japanese Style Woven Floor Cushions. After a long day of boating out on the Atlantic Ocean, clean and prepare your fresh catch at the Fish Cleaning table right in the Backyard. Every Fisherman needs a Home with a Kitchen... and the heart of this home features a stunning kitchen that is well equipped for entertaining while preparing home-cooked meals. Once your catch of the day is cooked and ready to be served... Guests can choose to eat inside at the Dining Table for 8, in the Family Room, or in the patio seating right outdoors. The SONOS system outside is perfect to entertain and turn on some music to set the Vacation mood! While some of your guests are outside listening to Music after dinner you could challenge your family to an Air Hockey Match, Poker, or even Bumper Pool. The Gameroom is ready to provide additional entertainment for everyone and sleeping space for your Guests with the discreet Murphy Bed. Need to check your emails while on vacation? Leave all of your worries behind, the entire home is equipped with a Smart TV in every room (except the Master Suite) and High-Speed Internet Access. Contact Sandy for more information at 305.432.1193. We only had to contact the team twice during our stay and they were wonderful to work with! On top of their game. Questions were answered and issues were resolved very promptly. The house was amazing. From the minute we walked in we fell in love with house and the outdoor space. Wished we would have booked an extra week ;) We all look forward to returning sometime in the future. What a wonderful home. Beautifully furnished and equipped with everything you need for the perfect get away. We rented for one week in October and had a full house. Every bedroom was occupied and we took advantage of the murphy bed in the game room which we all agreed was a great place with all the windows. We never felt crowded and spent much of our time outdoors lounging on the patio or floating in the well designed pool. The hot tub was a nice escape too. We brought two boats and had plenty of room for docking. Parking was no problem for two trailers and four vehicles. Sandy from Island Breeze was so nice to work with. I'm now officially in charge of vacation planning because I did so well choosing this house for our friends and family.